When the hubs and I were studying in London, we were lucky enough to take advantage of the long school breaks to travel the UK, Europe, and further afield — destinations we may not have been able to visit for a very long time if they hadn’t been so cheap and convenient from Heathrow or King’s Cross. Edinburgh was one such place. So, a few days before Christmas, as the sun set (around 2 p.m.), we climbed aboard our train on Platform 9 3/4 (only joking) and set off from London to spend a few lovely days in Edinburgh, Scotland. And we can’t wait to go back. Late summer is the “warmest” time to visit Scotland (bonus — you’re so far north, the sun stays “out” forever. Notice my liberal use of quotation marks.). However, if you’re willing to brave the cold, Hogamanay (New Years) in Edinburgh is a party not to be missed. Find a hotel within walking distance of The Royal Mile. 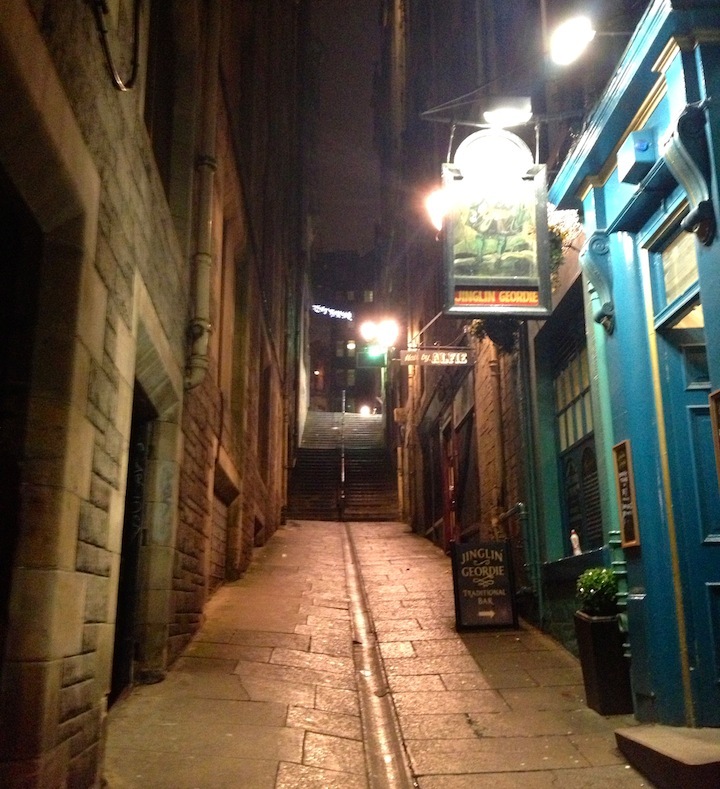 This is “main drag” of historic Edinburgh, a steep street lined with shops, pubs, churches, closes, and wynds that starts at Holyrood Palace and ends at its peak in the imposing Edinburgh Castle. We were able to stay about a ten minute walk from the thick of it for pretty cheap. Scotch is God’s gift to very cold people, aka the Scots. Basically, scotch is smoky whisky. It’s like that because the malt is cooked using peat, a very smoky fuel. If you’re like me, you love the “peaty” stuff — the really smoky scotch, a lot of which comes from Islay, off Scotland’s west coast. 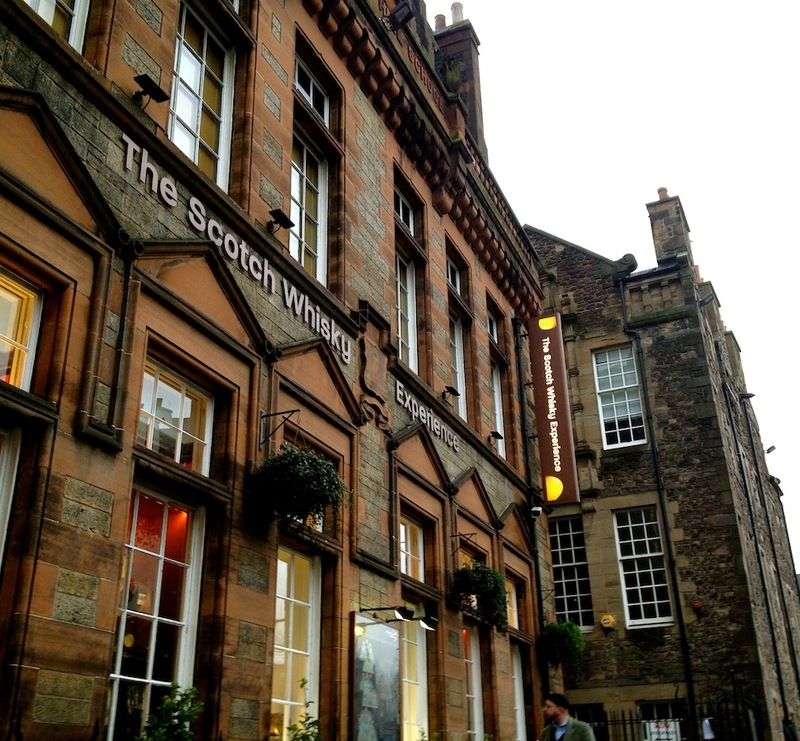 Even if you aren’t the biggest whisky fan, you must try a wee dram on any visit to Edinburgh. 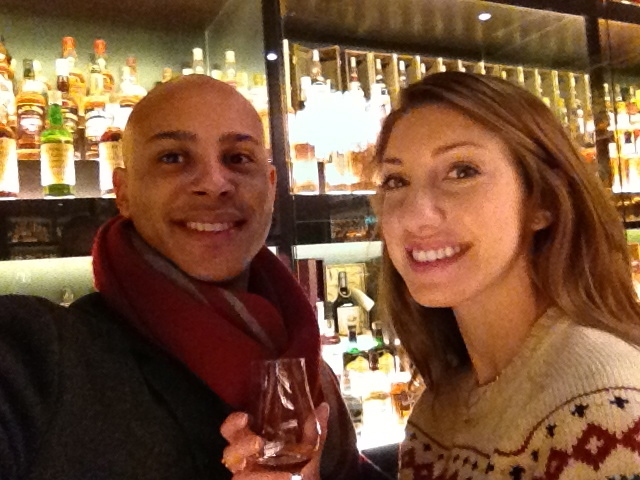 See “what to do” below for more tips on exploring Edinburgh’s scotch scene. When you hear “haggis,” you probably assume it’s something gross. On paper, you aren’t wrong. But in reality, haggis — if it’s done right — is flavorful, comforting, and (like scotch) absolutely necessary to survive the damp cold of Scotland. It’s usually served with neeps and tatties, but don’t be scared — that just means mashed turnips and potatoes. The best haggis we ate was at The Albanach, a lovely pub on the Royal Mile. Like haggis, you might not want to try black pudding if you Google what’s inside it — but that would be a terrible mistake. Black pudding is salty, crunchy, creamy, and carb-y all at once, and I could eat it every day. We had delicious black pudding at The Albanach as well, but most pubs do it pretty well. You can also find white pudding here and there, sometimes served in a traditional full breakfast. Walk the Royal Mile. Get lost (but don’t slip!) in its closes and wynds. Pop into its pubs for a dram or a pint. Stop into a shop for a wooly sweater — you’ll need it. 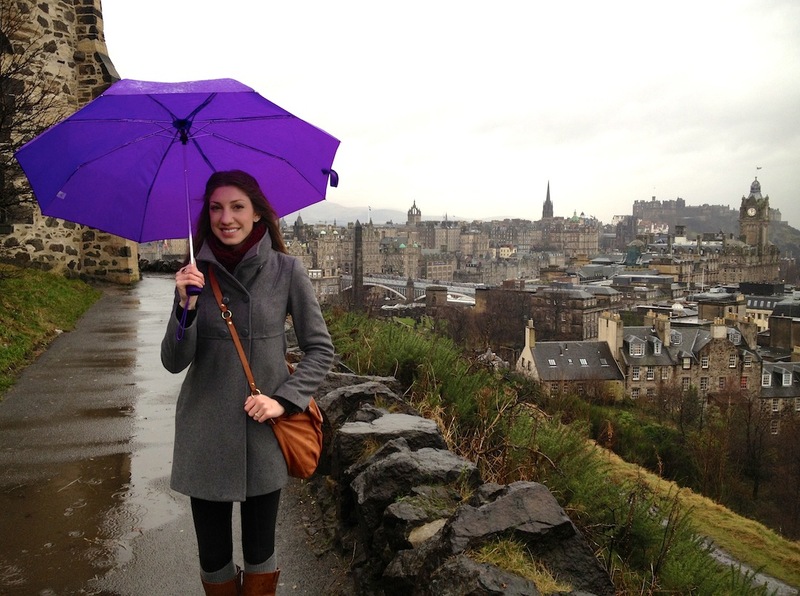 Pretend you’re living in medieval times, or in Outlander, or in Hogsmeade! 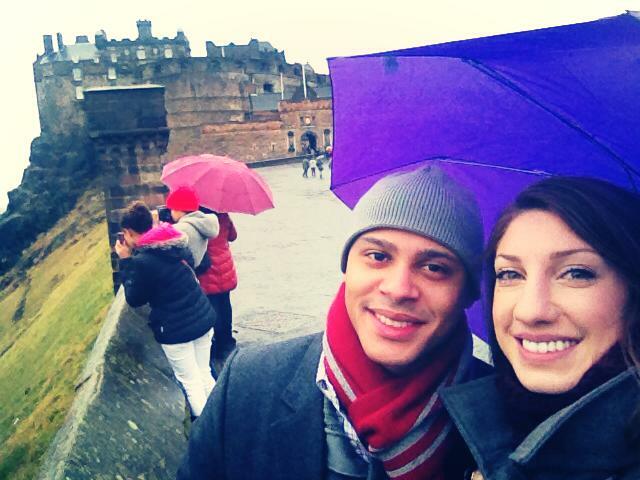 Visit Edinburgh Castle. It’s a massive fortress of a place, and incredibly well preserved. 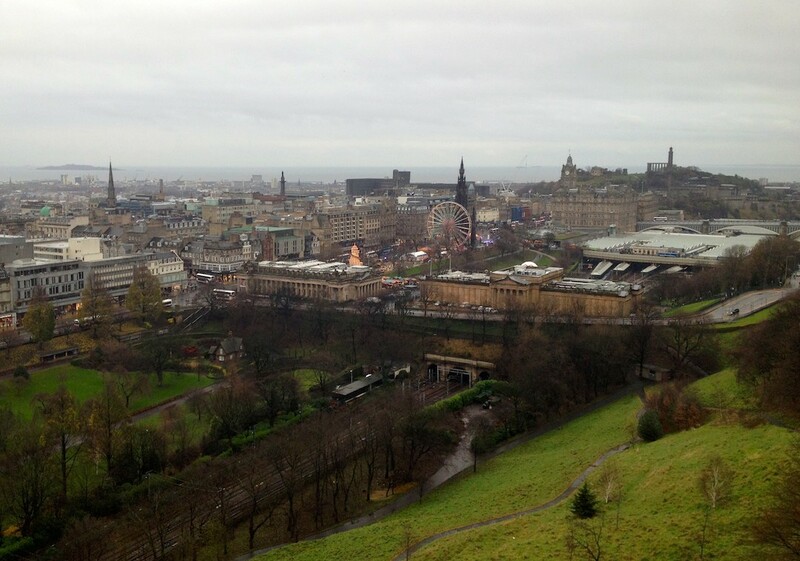 If you skip every other site in Edinburgh, at least walk the castle grounds, where you can get a full view the city. Your ticket inside the castle includes access to multiple exhibits, including the Scottish crown jewels and the national war memorial. For more sights from the olden days, check out St. Giles Cathedral, the Queen’s residence at Holyrood Palace, the stunning ruins of Holyrood Abbey, and the towering Scott Monument. Grab some fresh air on Calton Hill. Clamber up the stairs off Princes Street to check out this sprawling park, littered with multiple monuments and surrounded on all sides by fabulous views of the city, the sea, and the Salisbury Crags. Go shopping! For modern shops, take a stroll down Princes Street in the New Town, Edinburgh’s city center. For souvenirs and traditional fare, the Royal Mile and surrounding streets in Old Town are lined with shops selling tartan, kilts, wool sweaters, scotch, shortbread, bagpipes, and everything else that screams “Scotland.” Tartan scarves for the whole clan! When you’re tired of sightseeing, grab a warming pint at the Halfway House, Edinburgh’s tiniest pub located down the treacherously steep Fleshmarket (yes, flesh market) Close. 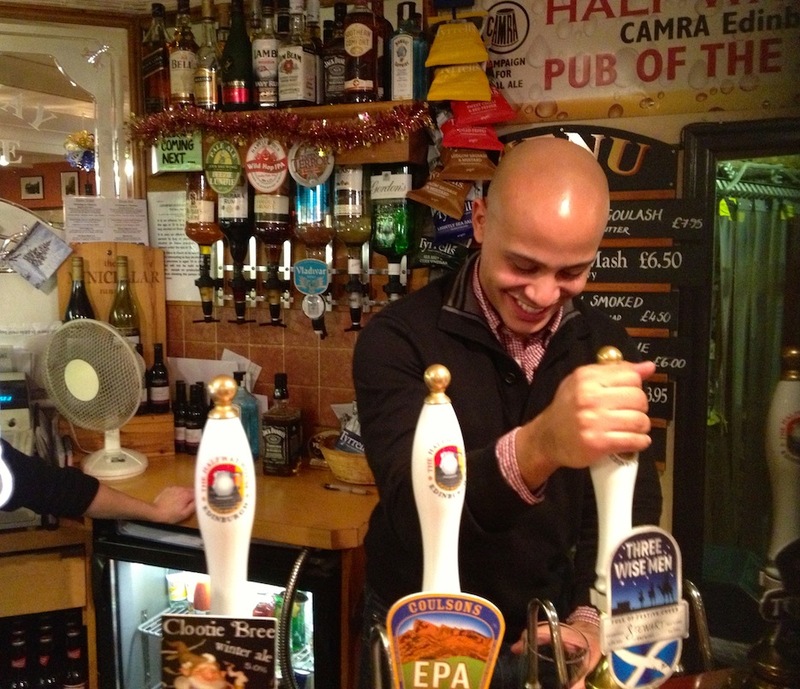 If it’s late and quiet, the barkeep may even let you come behind the bar and pull your own pint. Edinburgh may be freezing, but its delightful people, hearty food, smoky drink, and timeless charm will keep you cozy and warm.